Do not allow children, no matter their age, to tease your dog either physically or verbally. A child who shrieks and leaps incessantly beside a nervous puppy may drive him to snap out in fear, as will a child who grabs its tail or sits on it. If a child is persistent, remove him. Never allow him to continue. Do not let a small child pick up or carry a puppy. Puppies, like babies are scared of falling. They will often squirm and fight to free themselves. If panicked, they may even bite. Remember, in this case, it is not the puppy's fault, but yours for allowing the situation to progress to the point where the puppy can no longer cope. Encourage the child to get down to the puppy's level, i.e., the floor, in order to play safely. They can play all they like without either one getting hurt and the puppy is free to move away when he has had enough. Do not expect a puppy to absorb endless punishment in the form of constant noise or teasing. He will defend himself unless he has some place to go such as a kennel where he can go when he does not want to be disturbed. Make certain that everyone understands that he is not to be disturbed there, and then make sure that he is not. He will come back out when he is ready to. Do not leave your dog or any other dog unattended with small children no matter how trustworthy you may think the dog is. 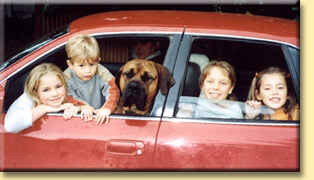 Although boerboels enjoy children more than any other breeds, they must be treated in the same way as any other large dog when around children. Do not buy a dog until you have a fenced off area in which you can keep it. Your children will love to be involved in the training of your puppy. This will prove to bond all concerned in a very cohesive manner. Insist that all children who come to visit abide by the same rules that you expect of your own. If a child refuses to act in a cooperative manner, send him home and avoid a tragedy. 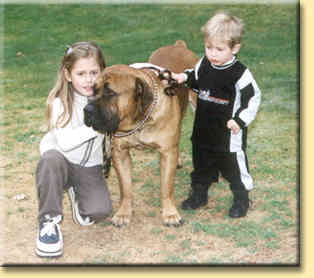 Actively encourage children to interact with your boerboel in the right way and you will build lasting, safe relationships. Teach the dog to sit before he is given food or a treat, and to wait for an okay to take it. 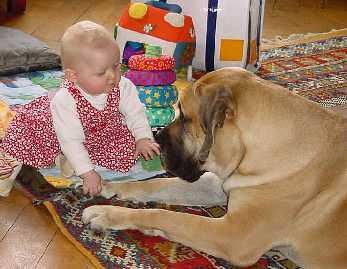 The boerboel pup will grow much faster than your toddler. If the 'sit', 'stay' becomes automatic, you will find him sitting in front of a baby with food, hoping but never touching. Parents of visiting children are less than understanding when your 75 lb. pup grabs for a cookie and their child goes tumbling. Many fears of dogs are traced back to just such an incident. 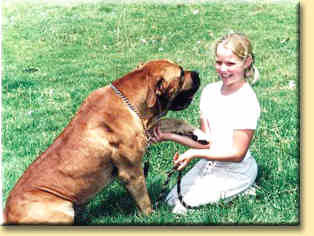 They will not only remember that it was a large dog but also that it was a boerboel. Never allow a small child to take the pup's food or bone as this could create a problem later when the pup has grown into adulthood. 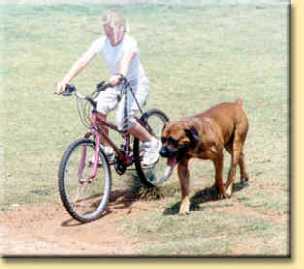 Give your Boerboel simple obedience training so that he will be spared random scolding and confusion. "DOWN" and "SIT" are pleasant commands to a pup if their young master rewards them with a brushing or a tummy rub. Don't expect the dog to be patient with your child unless you have taught him to be. He will learn not to defend himself, if he realizes that you consistently rescue him before he gets hurt. Conversely you must teach the small child to be patient with the dog. Don't reinforce his fears if he inadvertently takes a tumble by telling him what a big, mean, naughty dog that is. Be matter-of-fact, pick him up, put on a plaster, if necessary, and say, "Here, help me teach Max to be more gentle." Help the child learn to cope with the situation, reinforce his confidence with small things that he can handle, and be there to handle a situation that proves to be more that he can control. Do not expose an innocent passerby to your dog's protective tendencies. Increase your child's sense of responsibility and pride of achievement by letting him help as much as he can. Do not expect him to know what to do. Guide him. "Here is Max's dish, Billy, tell him to come. That's it, now tell him to sit." (You help Max sit. He is just learning that he must also obey Billy too.) "Good, now put the dish down. Tell him okay. There, see how nicely he obeyed you!" Billy will leave with the distinct impression that he is the world's smartest dog trainer and that his dog is the smartest dog on the block.